When you start ROBOCOLLAGE, you will see that TRACK 1 is open. 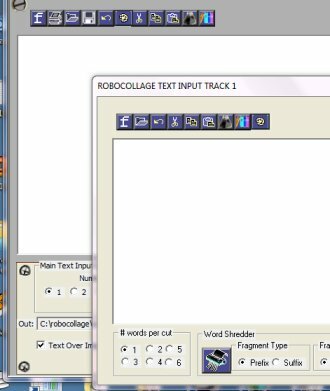 There are four INPUT tracks in total, but they do not need to be activated to build robocollages. You can just close the track 1 dialog and then all of the text to be sent to your collages will originate from the main input area.The supplementary input tracks have a few features which are not shared by the main text input screen: Firstly, you can fragment the words. Secondly, you can choose to leave the whole of the text contained in an individual track intact (whereas text in the main input is always scrambled). You could call these items the "global settings". Choose your output location and output file name. The html file will be created here, PLUS the randomly selected images will be copied to this location. The Text and Image sliders determine the relative blend of these inputs to a collage. Pushing up the "Image" slider to the max will fill your collage with a lot of randomly selected images. Click the IMAGE SOURCES button to select which image pools you want to draw from. The preloaded images have been identified by the suffix "PRE", so that users can easily tell which image pools are their own and which were preloaded into the application's database. 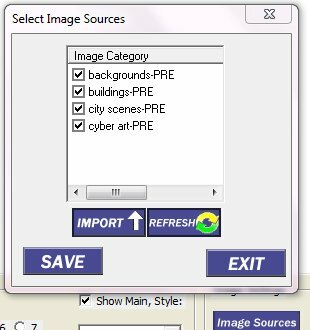 Here is the custom image load dialog, which allows users to build their own sets of images to use in their robocollages. There is one requirement which must be followed. You have to save your images as .gif files. 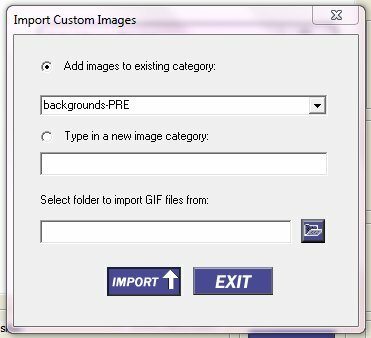 Most digital graphics and photo editing software will permit you to resave JPGs as GIFS. Another piece of advice for building good collages - if you get your images from a digital camera or cell phone, you should re-size them down considerably: The raw format of digital photos normally has too many pixels to be useful for this collage-building exercise. (Again, any digital editing package should allow for resizing - and many have batch functions where a number of images can be automatically resized all at once). For download instructions, go to the ROBOCOLLAGE Home Page.